Happy Friday! Well, it was a happy Friday until my day fell apart. It all started off well enough. I got some things done around the house while I waited for a yard guy to come and give me an estimate for some work. The guy came, I liked him, I started working on this blog post. While I was eating my lunch I got a call from my daughter’s teacher. There was a minor situation that required me to run up to the school. I had to reschedule an appointment with another yard guy because he was due to arrive before I would have time to get back. On the way to school, my car started acting up. Shaking and the check engine light flashing. I limped back home, and Google tells me it’s a cylinder mis-firing and that I shouldn’t drive the car until it gets fixed. Why do these things happen on Friday? Luckily I have the memory of this week’s Cook the Book Fridays recipe to keep my spirits up. We made Salted Butter Caramel-Chocolate Mousse, and boy was it good! The recipe starts off by having you make caramel. David’s instructions for the caramel were excellent; I knew just when to pull it off the heat. Next the chocolate is whisked into the caramel with a bit of fleur de sel. After cooling to room temperature, the eggs are folded in. The hardest part of this recipe is waiting 8 hours before eating it! The flavor and texture of this mousse is just fantastic. The salted caramel adds wonderful complexity to the flavors. 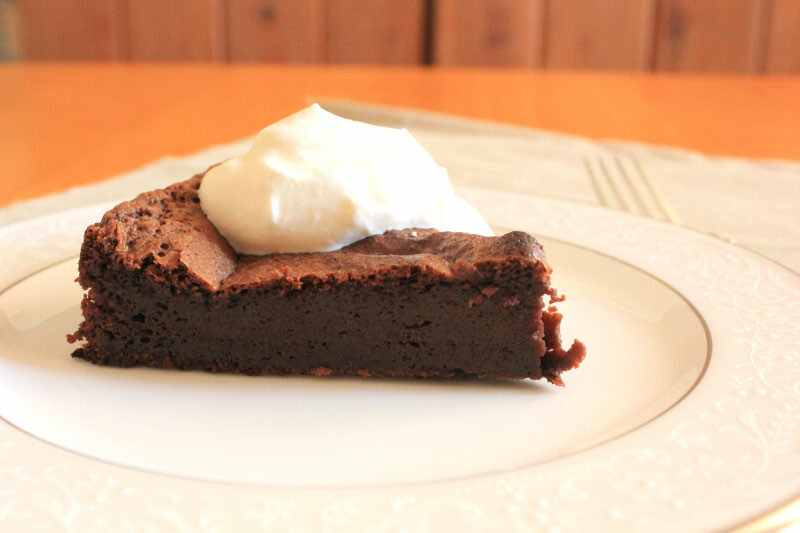 It was a big hit with my family, and may become my new go-to chocolate mousse recipe (sorry, Dorie!). Have a great weekend, and Happy Mother’s Day to all the mothers! You can find the recipe for Salted Butter Caramel-Chocolate Mousse on page 258 of David Lebovitz’s book My Paris Kitchen. Happy French Friday! It’s our 3rd of 4 “celebration weeks” for French Fridays with Dorie. This week we are to share the recipe from the book we have made the most often. Around My French Table. I have been so focused on completing all the recipes that I forgot to use the book for everyday cooking. Besides, I have all those other cookbooks on my shelves that needed some love, too. After poring through the book during these celebration weeks, I have a long list of recipes I want to make again. Now I just have to remember to actually use this wonderful book! The Chicken for Lazy People I discussed a couple of weeks ago is one of the few recipes I have made several times. Another is Top-Secret Chocolate Mousse. 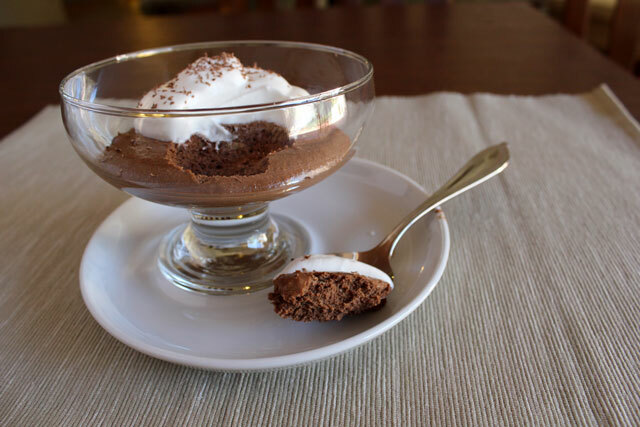 The Chocolate Mousse won our hearts when I first made it during the recipe’s assigned week. My husband declared it his favorite recipe yet, and I think he would still place it at the top of his list. I love it because it is delicious. But also because it is quick and easy to make (you can whip it up after dinner!) and doesn’t make a large amount. 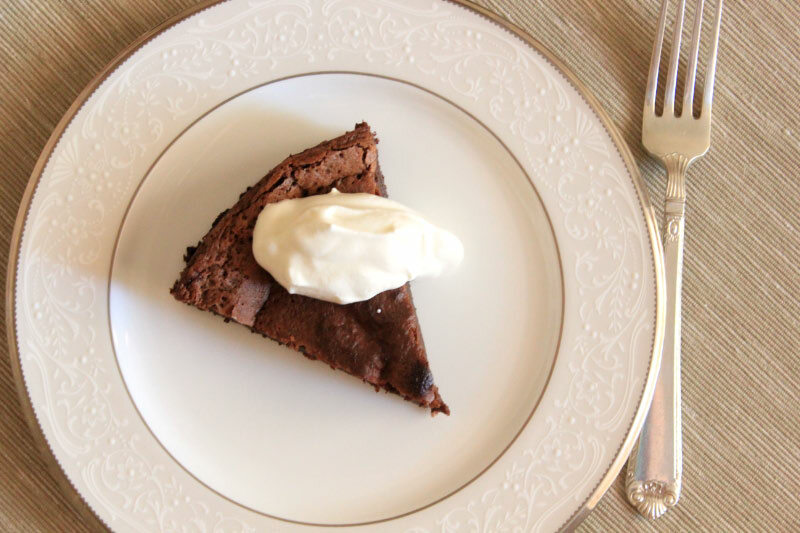 Perfect for when the two adults in this household want an indulgent treat! Happy Tuesday! My daughter is on Spring Break this week, so she helped me make this Tuesdays with Dorie treat. 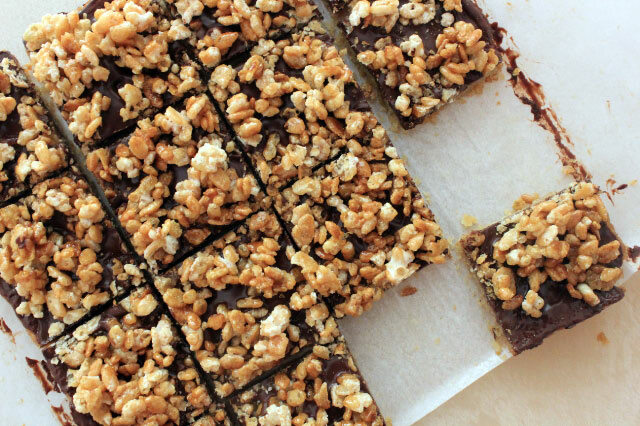 We made Crispy-Topped Brown Sugar Bars. The base of these bars is a simple, buttery brown sugar-based dough. It is spread in an 8″x8″ pan and baked until it turns golden brown. I had the benefit of making these a week late, and learned that many people found their base over-cooked when following the baking times specified in the recipe. I baked mine for 15 minutes and then checked it. It was bubbling and golden brown, so I took it out early. Next, we sprinkled chocolate chips on top of the cookie base. My daughter helped with this step, and only ate two of the chocolate chips! After the chocolate melted, I spread it evenly over the bars. Next, the Caramelized Rice Krispies. 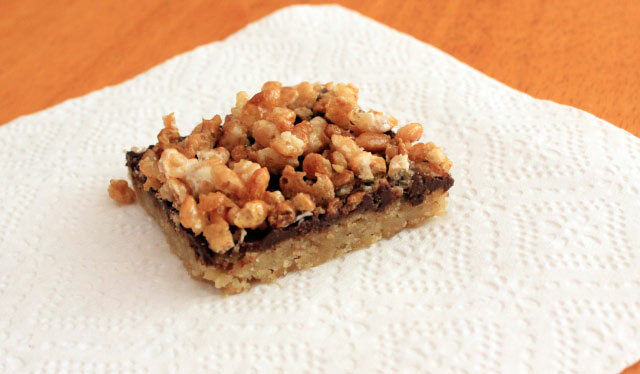 Oh, those Caramelized Rice Krispies! 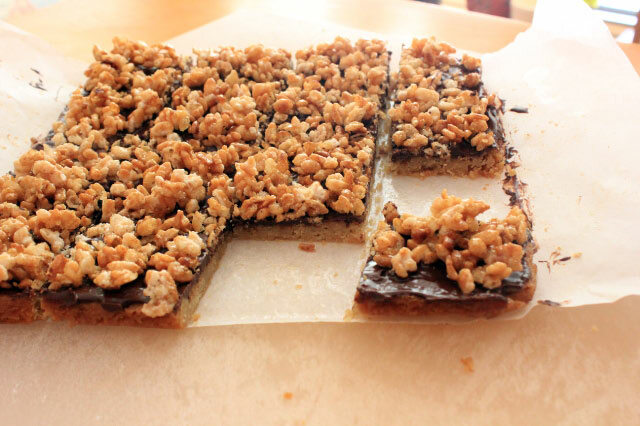 You could make just the rice krispies and be perfectly happy. I think Dorie knew what she was doing when she had us use only half the Caramelized Rice Krispies recipe. You wouldn’t have enough to cover the bars otherwise, because the cook would eat too many of the rice krispies before they made it onto the top of the bars! These bars are really good! My daughter had a little trouble eating these with the crispy topping, but once I picked the crisps off, she was was perfectly happy eating the chocolatey, buttery bar. Dorie suggests other toppings for these instead of the rice krispies, and I think coconut would be especially good. So far I have loved everything I have made from Baking Chez Moi. If you haven’t bought it yet, go run out and get it!